What do your students know—or think they know—about what causes night and day, why days are shorter in winter, and how to tell a planet from a star? 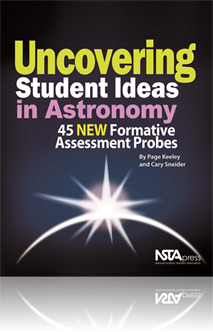 Find out with this book on astronomy, the latest in NSTA’s popular Uncovering Student Ideas in Science series. The 45 astronomy probes provide situations that will pique your students’ interest while helping you understand how your students think about key ideas related to the universe and how it operates. The book is organized into five sections: the Nature of Planet Earth; the Sun-Earth System; Modeling the Moon; Dynamic Solar System; and Stars, Galaxies, and the Universe. As the authors note, it’s not always easy to help students untangle mistaken ideas. Using this powerful set of tools to identify students’ preconceptions is an excellent first step to helping your students achieve scientific understanding. I love Page Keeley. Her prompts always bring the best out in students and help reveal their misconceptions in a totally non-threatening way. This is the seventh in a series that just been released. As a National Board Certified teacher, this is one of two series I would not be without in my professional library. I use this series with my middle school students in my classroom every opportunity I have. I also recommend them to those that are undertaking the National Board Certification process to help identify student misconceptions and providing evidence of student growth in learning. This book covers concepts associated with Astronomy. The sections are divided into, “The Nature of Planet Earth”, “The Sun-Earth System”, “Modeling the Moon”, “Dynamic Solar System”, and “Stars, Galaxies, and the Universe.” I am particularly in love with Prompt 5, “The Two Rs”. This prompt ferrets out student understanding around rotate and revolve. I also really like at the end of some prompts there is an “NSTA Learning Center Resources” section that tells you where you can go within the Learning Center for more help – SciGuides, SciPacks, Science Objects and other resources. All of the prompts have a “References” section with resources that range from articles, to websites, to applets and interactives.